Like many aspects of human culture, as well as life itself, music is in many ways inherently cyclical. Musical styles are continually evolving, but the courses of trends in both composition and performance are rarely linear. Perhaps the greatest marvel in music in the past century is the way in which musicians have simultaneously looked to the past and the future, the revival of interest in and study of music from the Sixteenth, Seventeenth, and Eighteenth Centuries markedly influencing the creation of new music. Still, this is anything but an isolated reality. From the pioneering efforts of Wanda Landowska, now regarded by the outspoken Early Music community in nearly equal measures as pariah and prophetess, to the attention of an array of composers spanning the spectrum from Francis Poulenc to Gerald Busby, the harpsichord has benefited enormously from the unique rejuvenation of an unparalleled fusion of past and present. At the apogee of this juggernaut of reassessment and repurposing of an instrument still linked in the minds of many listeners solely with music composed before 1800 is Welsh harpsichordist Christopher D. Lewis. 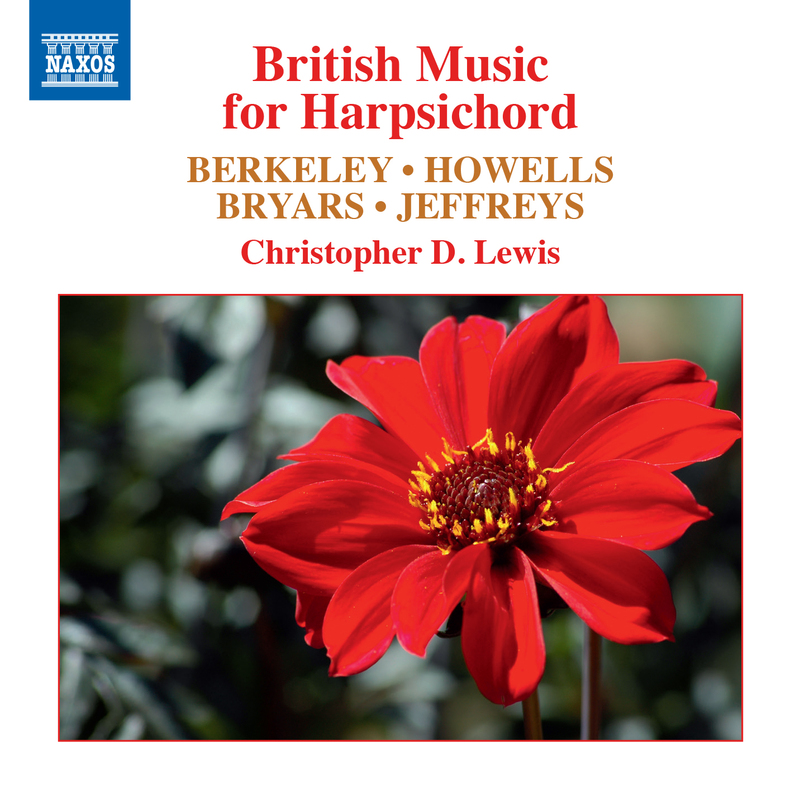 As much a musical adventurer as a well-trained virtuoso, Lewis takes the listener during the seventy-one minutes of this thoughtfully-planned and expertly-engineered NAXOS disc on a sometimes challenging, always captivating trek through under-explored compositions for the harpsichord by contemporary British composers. Like Poulenc’s Concert champêtre and Busby’s Court Dances, Parallel, and Camera, these works greatly enrich the harpsichord repertory. Hearing them played by Christopher D. Lewis with a delightfully sophisticated but still unsullied blend of youthful exuberance and artistic maturity substantially enriches appreciation of the capabilities of the harpsichord. 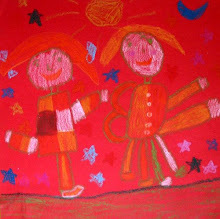 Born in Rhiwbina, Wales, Lewis has obviously been influenced virtually since infancy by his native land’s love of music. His pursuit of education and expansion of his cosmopolitan sensibilities having taken him throughout the world and brought him into contact with some of the foremost masters of the harpsichord, he is especially qualified to bring ‘new’ music for the instrument to the attention of today’s listeners. Sir Lennox Berkeley’s Mr. Pilkington’s Toye and For Vere are ideal showcases for Lewis’s abilities. Playing harpsichord music of any era naturally requires mastery of the technical constitution of the instrument’s mechanism, and this Lewis has of course attained and displays uninhibitedly, but engagingly performing music for an instrument that in many modern minds belongs in Baroque basso continuo consortiums and opera house orchestra pits demands interpretive skills of a particular order. It is apparent in his jocular, even impish playing of Berkeley’s Mr. Pilkington’s Toye that Lewis is the man for the job. Of a wholly different emotional fettle is For Vere, but the performance that it receives from Lewis is of complementary excellence, technique again sharing pride of place with expressive intuition. These pieces do not inhabit the progressive world of Berkeley’s Symphonies, the opera Ruth, and the Missa Brevis, but they possess a purity of invention that is tellingly highlighted by Lewis’s unaffected style of playing. Herbert Howells was one of Britain’s most gifted composers of the Twentieth Century, but aside from his poignant motet Take him, earth, for cherishing, written to memorialize President John F. Kennedy and imbued with the composer’s mourning for the death of his own son, his work is little known and far too infrequently performed beyond Britain’s borders. The excerpts from Howell’s Clavichord presented here by Lewis provide opportunities to examine facets of Howell’s ingenuity that are astonishingly unlike the melancholically atmospheric choral works upon which his reputation is mostly—and not unjustly—founded. The pieces on this disc afford a glimpse of a lighter-hearted Howells, his talent for musical portraiture making the sequence of works played by Lewis a study in the art of tuneful characterization akin to Elgar’s Enigma Variations. The identities of the ‘visitors’ in each of the pieces are not difficult to discern, but the voice that emerges most resonantly from the chorus is Howells’s. The lovely ‘Goff’s Fireside’ is offered in performances on the 1997 Flemish double harpsichord after the Ruckers school by San Francisco-based maker Kevin Fryer employed for the balance of the Howells pieces and a 1982 Australian replica of a 1604 muselar, the peculiar northern European, right-oriented virginal, both responding dulcetly to Lewis’s touch. 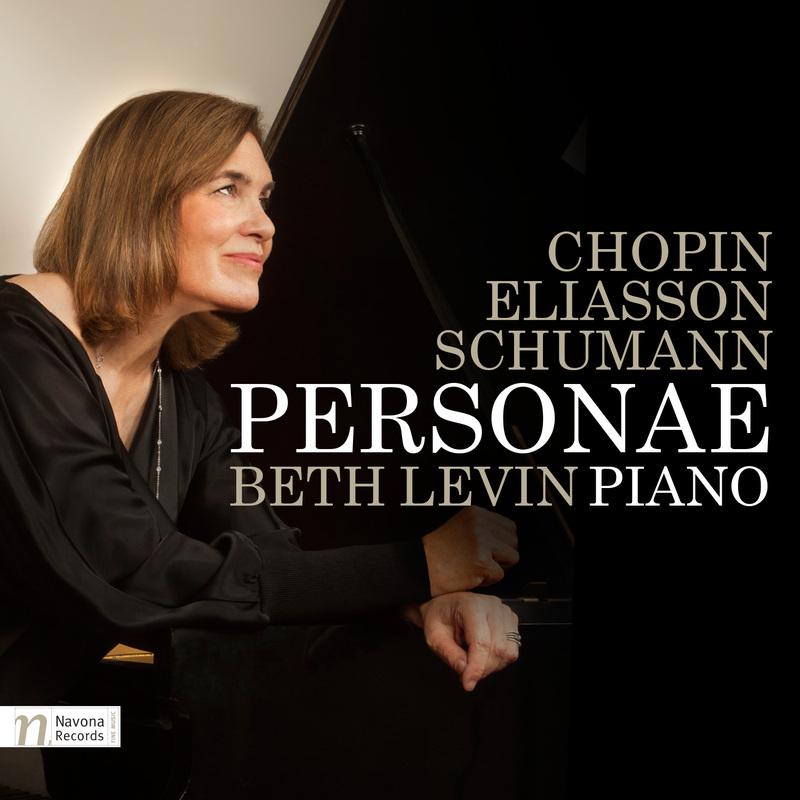 [Other selections on the disc are played on a Pleyel harpsichord dating from the 1930s, an instrument of the type espoused by Wanda Landowska and in this case originally purchased by Toronto’s historic Eaton Auditorium.] 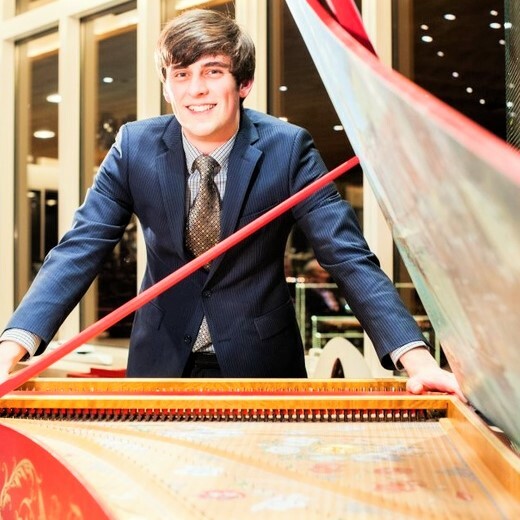 The Arcadian lilt of ‘Patrick’s Siciliano,’ enchantingly phrased by Lewis, is followed by the explosive ‘Jacob’s Brawl,’ in which the young harpsichordist’s nimble fingers deliver jabs and hooks that never miss their marks. Then, the deceptive flow of ‘Dart’s Sarabande’ is transformed by Lewis into a radiant, almost operatic account of ‘Andrew’s Air,’ the musician’s technical and interpretive dexterities finding compelling outlets in Howells’s music. An early champion of restoring to Baroque repertory some measure of authentic, period-appropriate performance practices, Sir Adrian would be thrilled by Lewis’s crisp, rhythmically dazzling playing of ‘Boult’s Brangill.’ ‘Dyson’s Delight’ is, as played here, just that: a delight. ‘Ralph’s Pavane and Galliard’ are unconventionally symmetrical, and the intelligence with which they are dispatched by Lewis gives them elements that bond as naturally as hydrogen and oxygen. The title of ‘Finzi’s Rest’ might at first glance be deemed a misnomer, but the quietude at its core, enhanced by Lewis’s finely-judged approach, confirms the sagacity of Howells’s insight. There is indeed a visionary epic lurking beneath the simple façade of ‘Malcolm’s Vision,’ and Lewis is careful to spotlight but not exaggerate it and succeeds by interpreting the piece succinctly. His performance of ‘Julian’s Dream,’ one of the finest of these pieces, is aptly ethereal without descending into saccharine over-emoting. Any listener whose view of Howells is of a humorless wretch composing in order to excise his demons should hear Lewis’s performance of ‘Walton’s Toye’ if only to realize how unfair it is to thus dismiss this wonderfully multi-dimensional composer. Lewis has performed a great service to Howells with this recording. Played by Lewis with precisely the right balance of free-spiritedness and seriousness, Gavin Bryars’s After Handel’s “Vesper” is a work of considerable charm and artistic merit, an affectionate homage that wields the cutting edge of typically British parody. There is nothing explicitly satirical in Bryars’s music, per se, but the nod to the great tunesmith of Brook Street is at least as good-naturedly humorous as it is artistically reverential. The same can be said of Lewis’s playing of the piece: in short, his performance is tremendous fun but never farcical. One hears Händel like a voice from another room—a mighty, strongly-accented voice, natürlich, but not an overbearing one. The amiable conversation that Bryars shared with Händel is gleefully shared by Lewis with the listener. Among the composers whose works are featured on this disc, John Jeffreys will perhaps be the least-familiar to listeners without in-depth knowledge of British music in the second half of the Twentieth Century. 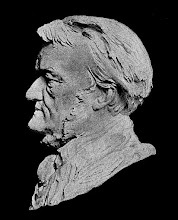 Lacking the widespread recognition allotted to Britten and Tippett, Jeffreys was no less a dedicated artist than his more famous countrymen, and in certain respects, not the least of which is its unapologetic melodic appeal, his music is more accessible than his colleagues’ frequently-played scores. His Four Little English Dances in the Georgian manner are vibrant pieces, their broadly-styled structures reminding the listener that, from a strictly historical perspective, the ‘Georgian manner’ encompasses virtually all of the Eighteenth Century and a sliver of the Nineteenth, too. The Poco allegro dance transports the hearer to the stately sitting rooms of Bath, where one might have a turn about the floor with the denizens of Henry Fielding’s novels. There is as much of Sir Arthur Sullivan in Jeffreys’s idiom as there is of Thomas Arne and William Boyce, and Lewis plays the music with sonorous, mercurial charm. He phrases the Andantino with a delicacy that seems more Victorian than Georgian, disclosing a lightness in the music that hints at strict-mannered aloofness. Likewise, the subtle but uncomplicated strains of the Poco andantino might just as accurately be described as being in the Edwardian manner, there being a vein of restraint coursing through the music. Ever a communicative artist, Lewis here divulges that his gift for subtlety is as commendable as his flair for boldness. The vivacious Allegro ma non troppo dance is a boisterous British stag party in musical form: Lewis’s playing earns him—and the composer—a hearty pint. For many otherwise well-informed advocates of Classical Music, the harpsichord is perceived as an instrument that, in its natural habitats of sorts, tinkled unobtrusively as fat castrati shouted hours of tedious recitative at one another and as bewigged ladies, corseted within a millimeter of asphyxiation, chatted about nothing; and that it is now a living relic, a quaint musical dinosaur encountered without great interest except when entrusted to the hands of virtuosi who play the immortal masterworks of Bach, Händel, Rameau, the Couperins, and the Scarlattis. In music, though, anything of extraordinary merit is unlikely to go unnoticed indefinitely, and it is to their credit that Twentieth- and Twenty-First-Century composers have embraced the harpsichord as a thriving, thrilling vehicle for their creative impulses. Neither this fascinating instrument nor the contemporary composers who write for it could hope for representation on disc by a more persuasive musical proselytizer than Christopher D. Lewis. For every work that clings to a place in the international repertory there are countless others that are neglected, forgotten, or lost. This is especially true of musical settings of scriptural accounts of and responses to the Passion of Christ. From the earliest unions of words and music, the persecution, death, and resurrection of Christ have been themes that engage the imagination, the parallels among Christ’s suffering, the tribulations endured—and perpetrated—by the Church, and man’s daily struggles inspiring artists to seek in music modes of expression for sentiments too ephemeral for words alone. From the medieval courts of Europe to the studios of Twenty-First-Century composers, music exploring the anguish of Christ’s crucifixion and the hope of the resurrection has occupied the creative energies of many artists, but it is no exaggeration to assert that the Passion music of Johann Sebastian Bach has not unjustly garnered prominence that casts shadows from which other scores toil, often futilely, to emerge. The prevalence of Bach’s fleet, viscerally exciting Johannes-Passion and compellingly profound Matthäus-Passion in Eastertide performance schedules leaves little time for the Passions of Heinrich Schütz, Johann Mattheson, and Georg Philipp Telemann, all more widely influential in the first half of the Eighteenth Century than Bach’s Passions. Händel’s Brockes-Passion remains lamentably under-appreciated, and even his Messiah, Parts Two and Three of which deal with Christ’s trial, execution, and resurrection, is often inexplicably scheduled for performance only in the Christmas season, especially in the USA. Aside from a pitifully small handful of works by Alessandro Scarlatti, Vivaldi, Pergolesi, Jommelli, Salieri, Paisiello, and Cimarosa, known but rarely performed, Italian Passion music is one of the least-explored niches of Classical Music. From this perspective, Glossa’s recording of Antonio Florio’s new performing edition of Gaetano Veneziano’s little-remembered Passione secondo Giovanni is especially treasurable, but a recording as fine as this one is welcome from any point of view. Given an opportunity of this artistic magnitude to make the case for its renaissance, Veneziano’s music brings John the Apostle’s harrowing recounting of his beloved master’s last days among men to poignant, devoutly melodious life in a performance that makes the more than three centuries of silence to which the score has been subjected all the more mystifying and exasperating. Born in Bisceglie in the Apulia region of southeastern Italy in 1656, Gaetano Veneziano is now little more than a footnote in musicological tomes documenting the progress of Italian vocal music from the stylistic bellwethers Monteverdi, Cavalli, and Frescobaldi to the High Baroque of Alessandro Scarlatti, Benedetto Marcello, and Vivaldi. A pupil of Francesco Provenzale at Naples’s Conservatorio Santa Maria di Loreto, where he was named maestro di cappella in 1684, Veneziano was sufficiently respected as a composer of sacred music to later be selected as Alessandro Scarlatti’s replacement as director of the Spanish Viceroy’s Capilla Real in Naples—a post from which politics ousted him after only three years when the Austrian Hapsburgs wrested Naples from their Spanish cousins’ control. Early in his Neapolitan tenure, likely in 1685 [the year of Bach’s birth, appropriately enough], Veneziano composed his Passione secondo Giovanni for his adopted city, where he died in 1716. Whether the work, scored for soloists, a choir of nine parts, strings, and basso continuo, was intended for performance by Conservatorio Santa Maria di Loreto personnel is a matter of conjecture, but the dual intimacy and splendor of the edition and performance prepared by Florio suggest that Veneziano’s music would prove uniformly effective in academic, ecclesiastical, or theatrical settings. The Passione is an intriguingly multi-faceted work, pockets of fiorature in the style of Provenzale mingling with pages of blossoming lyrical expression; and in that vein as much an intersection of old and new styles as Pergolesi’s Stabat mater. Following Florio’s lead, the musicians of Cappella Neapolitana play with technical acumen that never supersedes the beauty of the sounds that they produce. Organist Carlo Barile, harpsichordist Patrizia Varone, and theorbists Franco Pavan and Paola Ventrella collaborate to fashion a basso continuo that is a vibrant organism within the drama. They create a foundation upon which Florio and the strings—violinists Alessandro Ciccolini, Marco Piantoni, Rossella Pugliano, and Matteo Saccà, violist Rosario Di Meglio, cellists Jorge Alberto Guerrero and Adriano Fazio, and double bassist Giorgio Sanvito—create a stunningly beautiful aural edifice, the sounds of their instruments often eerily replicating the moods of the Latin text. It is expected that Florio’s knowledge of and affection for the Passione should be extensive, but the organic cohesion and unflagging drive of his pacing of this performance are admirable in any context. Aided by his cast and chorus, several of whom adhere to Baroque practice by singing solo and choir parts, Florio translates his zeal for revitalizing this score into a performance that, even on disc, exudes a deeply visceral commitment to musical storytelling. In the introduction to the Gospel that begins the Passion, ‘Passio Domini nostri Jesu Christi,’ it is immediately apparent that the Evangelista will face very demanding music and that countertenor Raffaele Pe will meet every demand unflinchingly. Articulating the words of the Apostle, Pe’s effortlessly-projected voice traverses the range of the music with chameleonic colorations rarely heard in a male alto’s singing. When joined by the sensitive but virile Christus of tenor Luca Cervoni and the chorus in ‘Iesus itaque sciens omnia,' Pe’s Evangelista interacts with his colleagues with far greater immediacy than many Evangelists in Bach’s Passions, participating in the events that are unfolding rather than uninvolvedly reciting Scripture. With the bass incarnations of Christ in Bach’s Passions prominent in the mind’s ears, a tenor Christ is a novelty, and Cervoni’s sympathetic portrayal is characterized by ingratiatingly full-toned but stylish singing. The Ghislieri Choir singers—sopranos Valentina Argentieri, Marta Redaelli, and Sonia Tedla, altos Isabella Di Pietro and Marta Fumagalli, tenors Michele Concato and Paolo Tormene, and basses Renato Cadel and Renato Dolcini—also dedicate their throats and their intellects to serving the needs of the drama, enhancing the performance with utterances that have the impact of chorus interjections in Greek tragedy. Cervoni’s singing lends ‘Mitte gladium tuum in vaginam’ wonderful momentum, and Pe again delivers the Evangelista’s lines with astounding beauty of tone and a degree of technical accomplishment as near to perfection as is imaginable in such challenging music. Emerging from the chorus, Argentieri and Dolcini provide a dangerous account of the Ancilla’s accusation and a wrenching statement of Simon Petrus’s first denial of Christ. Pe phrases ‘Stabant autem servi et ministri’ with anxious intensity, the focus of his tone imparting the Apostle’s sense of foreboding, and his subtle but nuanced expressivity is matched by Cervoni and Dolcini. Cervoni voices ‘Si male locutus sum’ with refinement, but Argentieri’s reading of the Servus’s denunciation of Simon Petrus introduces a disquieting menace that erupts in Dolcini’s pained fulfillment of the prophecy of his threefold denial of Christ. The choristers again execute their parts with spot-on musical and dramatic instincts. Bass Marco Bussi’s dark-grained timbre renders his Pilatus easily discernible, but he shares Pe’s gift for insightful inflection though, not inappropriately for Pontius Pilatus, his vocalism is less polished than his colleague’s. Bussi unleashes an unmistakable arrogance in ‘Quam accusationem affertis,’ openly challenging Christ and seemingly reveling in his character’s feeble but insurmountable authority. Singing with the unperturbed grace of undiminished faith, Pe’s Evangelista imparts to the listener that, for all of his self-conscious regality, Pilatus is merely playing the part meant for him by divine will. Here and in ‘Et dabant ei alapas,’ Pe, Bussi, and the choristers employ both their voices and the words that they sing like brightly-hued tiles in a mosaic, creating a landscape in which Gethsemane and Golgotha are conjured with plaintive credibility. The potency of Cervoni’s enunciation of ‘Non haberes potestatem’ is answered by Pe, the chorus, and Bussi in accents of starkly divergent despair and insouciance, differentiated not by compromising tonal quality but by giving full weight to every word and full expression to every emotion. ‘Ut Scriptura impleretur, dicens,’ the Passione’s closing sequence, in many ways resembles an extended motet for the Evangelista and Christus, a powerful exposition of the individual and universal implications of Christ’s death and resurrection. Pe’s interpretation of the Apostle’s words delves deeply into the man’s, not just the disciple’s, love for his master, but it is the unaffected beauty of his vocalism that reveals the Evangelista’s heart to the listener. Cervoni’s Christus, too, is a portrayal focused on examining Christ’s individuality by singing his music stylishly and straightforwardly. In this performance, Veneziano’s music succeeds as few composers’ works in a similar vein have done at humanizing both Christ and the Evangelist: they are archetypes, of course, but they are not carved-stone icons that sink in seas of symbolism. Owing to the uncommon musical integrity of this performance, they are here what they surely were in life: extraordinary, ordinary men. Few are the courageous souls who would dare to contradict the notion that Georg Friedrich Händel’s Messiah is one of the most beloved creations in the history of Western Art. Composed in a three-week period in 1741 at a pace that astounds modern observers but was unremarkable for the famously industrious Händel, the score of Messiah is noteworthy for its relative originality: per capita, more of its numbers are unique to the score than their brethren in many of the composer’s operas and oratorios. What is unjustly less frequently the subject of laypersons’ praise are the extraordinary histrionic quality and emotional impact of Charles Jennens’s (1700 – 1773) libretto for Messiah. His work was merely arranging Biblical passages, it might be argued, but he did so with the theatrical acuity of Metastasio, da Ponte, and Boito. Jennens’s was a life of comfort that enabled him to dabble in the Arts, and his appreciation of Händel’s music yielded libretti for several of the Saxon’s oratorios, not least among which is his persuasive text for the masterful Saul. Jennens’s advantageous situation afforded him considerably greater access to the Arts community in Eighteenth-Century Britain than his talent and education likely merited, but his libretto for Messiah confirms that he was not merely a dilettante with a measure of piety. Relying slightly more upon the poetic prophesying of the Old Testament than on the New Testament’s fulfillment narrative, Jennens created with a commendable economy of words as complete a portrait of the life of Christ as has grace any book, canvas, or score in the two millennia of Christian ideology. His oft-quoted low opinion of Händel’s treatment of his libretto notwithstanding, Messiah was from the time of its 1742 première in Dublin acknowledged as a pinnacle of its composer’s art. 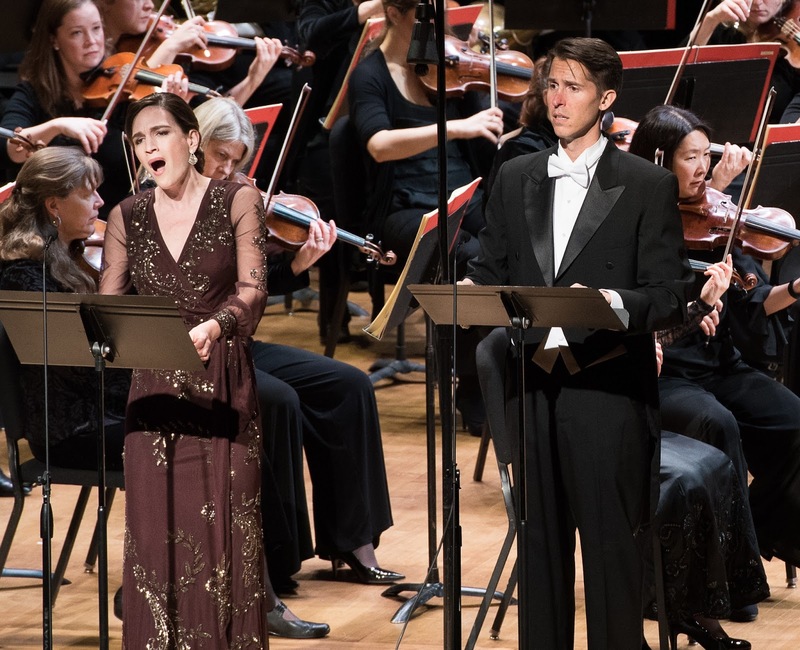 In the second decade of the Twenty-First Century, Messiah remains one of the most frequently-performed works in the standard repertory, its popularity having endured a fascinating cycle of performance trends. Like the King James Version of the Bible, Messiah is a compelling work of art whether the individual listener accepts its subject matter as fact, fable, or a synthesis of the two. 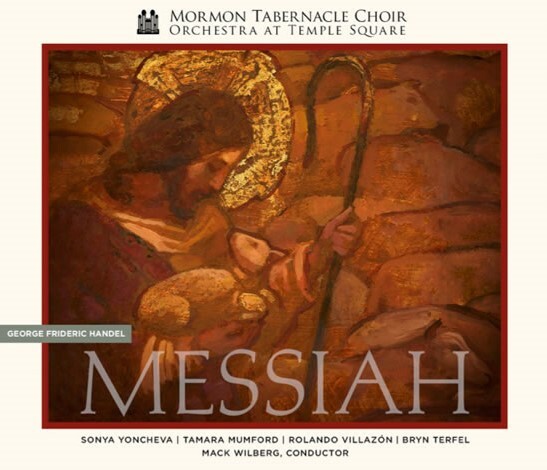 Regardless of its provenance, this new recording of Messiah by the renowned Mormon Tabernacle Choir is most valuable because it approaches the score not as a dogmatic sermon in three parts but as an artistic entity of extraordinary global significance. Recorded with meticulous attention to recreating within the confines of the listener’s space the legendary acoustics of the Mormon Tabernacle, this Messiah distills nearly three centuries of traditions into a performance shaped not by fads and theories but by undeviating trust in the unimpeachable quality of Jennens’s wordsmithing and, above all, Händel’s music. Owing in large part to the commendable emphases placed by The Church of Jesus Christ of Latter-day Saints on respecting and maintaining both body and soul, Salt Lake City, Utah, is one of America’s fittest, most vibrantly youthful metropolitan areas, its stunningly beautiful setting at the foot of the Wasatch Range reflected in the exuberantly reverent architecture of Temple Square, the Mormon Church’s Vatican City. When walking the streets of Salzburg, seeing the twin spires of Salzburger Dom and the majestic Festung Hohensalzburg towering over the city, it is impossible to ignore the ethos of the place that must have stoked the young Mozart’s imagination, and a similar energy, the spirit that has inspired generations of Utahans since Brigham Young arrived in the Salt Lake Valley in 1847, permeates modern Salt Lake City. It was on 22 August 1847, less than a month after ending his cross-continental trek to Utah, that Young organized the Mormon Tabernacle Choir, thus establishing a musical institution that now has nearly as extensive a history with Messiah as the British choral societies by which the score was stewarded throughout the Nineteenth and Twentieth Centuries. In the performance on these discs, Mormon Tabernacle Choir’s Music Director Mack Wilberg offers his own edition of Messiah, combining elements of historically-informed performance practices with vestiges of the Viennese tradition enshrined in the version of the score prepared by Mozart at Baron van Swieten’s request and the monumentally-scaled Victorian approach to the score. 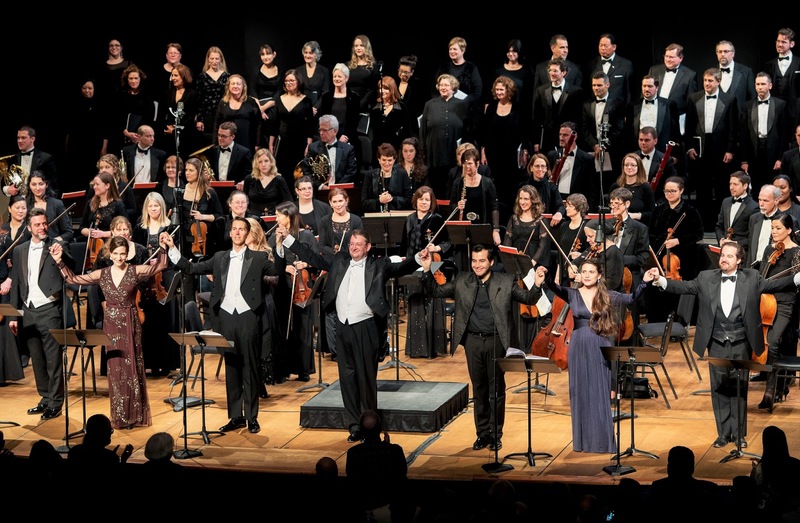 With its ensemble of nearly 450 singers and instrumentalists, this is a Messiah that will not find favor with many period practice purists, but not one bar of Händel’s music is expanded to proportions greater than it can support. Under Wilberg’s direction, the Orchestra at Temple Square musicians play virtuosically, the winds making their lines retained from Mozart’s edition of Messiah sound indispensable alongside Händel’s authentic scoring. Propelled by the creative but unobtrusive organ and harpsichord playing of Richard Elliott, Clay Christiansen, and Andrew Unsworth and the cello continuo of Elizabeth Marsh, the orchestra’s performance is robust yet refined. Aided by the expert engineering team, Wilberg molds a traversal of Messiah that is enjoyably grandiose without being detrimentally elephantine. The familiar names among the quartet of soloists might at first be interpreted as a conscious endeavor to spur sales of this recording. Be that as it may, each of the soloists contributes distinctive qualities that heighten the artistic standard of the performance. The opening bars of the recitative ‘Comfort Ye My People’ reveal Mexican tenor Rolando Villazón to be in fine voice. The surprising fluency in florid writing evident in his previous recordings of Monteverdi, Händel, and Mozart works is even more prominent in his singing here. Villazón’s stylish ornamentation encompasses a genuine trill, and he mostly eschews operatic posturing, instead phrasing with intelligence and straightforward eloquence. His English is accented but clear; far more intelligible, in fact, than the diction of a number of native English speakers who have recorded Messiah. 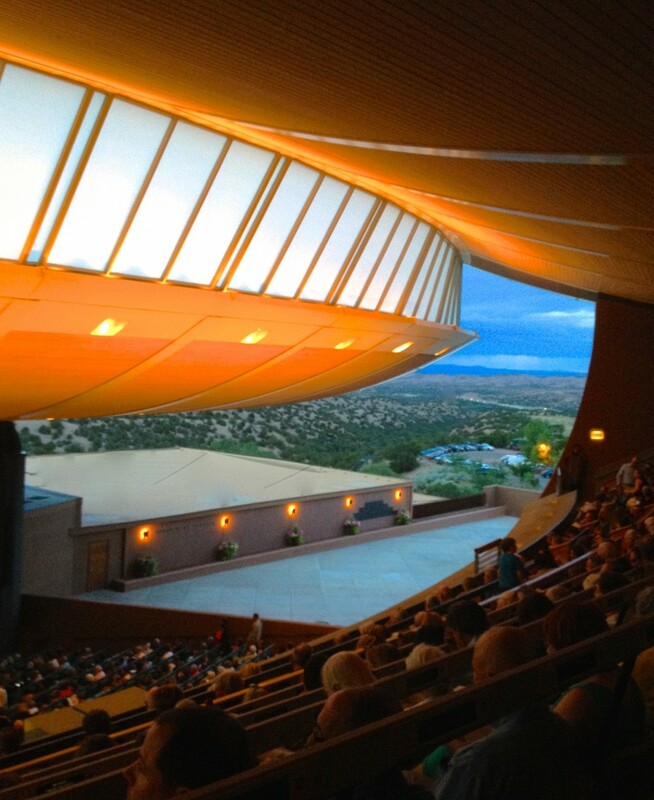 Villazón dispatches the divisions in ‘Ev'ry Valley Shall Be Exalted’ with aptly exultant ease. The sequence of anguished utterances for the tenor in Part Two receives from this tenor a performance of touching simplicity, the drama extracted from rather than imposed upon the music. The stinging bitterness of ‘All They That See Him, Laugh Him to Scorn’ and ‘Thy Rebuke Hath Broken His Heart’ is all the more visceral for the music being sung with such beauty, and Villazón voices the deceptively lilting ‘Behold, and See If There Be Any Sorrow’ as enthrallingly as any tenor who has recorded it, recalling both Jon Vickers’s power and the reedy brilliance of Philip Langridge. The halting uncertainty of his singing of ‘He Was Cut Off out of the Land of the Living’ suggests an inner struggle to express sentiments too appalling to be given voice, but the contrast with the brighter, almost cathartic ’But Thou Didst Not Leave His Soul in Hell’ is stirring, Villazón’s bronzed timbre glowing in the major-key sunlight. An atmosphere of anxiety permeates his readings of ‘Unto Which of the Angels Said He at Any Time’ and ‘He that Dwelleth in Heaven.’ Particularly impressive musically and dramatically is Villazón’s singing of the demanding ‘Thou Shalt Break Them,’ his voice darting through the runs and attacking the tricky intervals with the resonant strike of the rod of iron of which he sings. There is a sense of absolving vindication in his articulation of his lines in the brief duet ‘O Death, Where Is Thy Sting.’ Villazón is a gifted, unfailingly interesting singer whose work is not always conventionally appealing. There is nothing unappealing in his singing in this Messiah, and the healthy dose of Latin fervor that he injects into the performance is welcome when the instrument of its injection is such solid, satisfying singing. Welsh bass-baritone Bryn Terfel is no stranger to recording Messiah, and it is encouraging to hear his voice on splendid form in this traversal of the bass solos. The passagework in ‘Thus Saith the Lord’ is no longer negotiated as suavely as it was when Terfel first recorded Messiah, but the sheer brawn with which he navigates his way through the music remains impressive. His polished-teak timbre conveys the gravity of ‘For Behold, Darkness Shall Cover the Earth’ and ‘The People That Walked in Darkness’ without artificial heaviness, and he still ascends to E above the stave without strain. The attacks on the fearsome fiorature in ’Why Do the Nations So Furiously Rage Together’ are not completely clean but lack nothing in terms of raw energy, the text coursing through the music like venom. Terfel is at his best in Part Three, in which his voicing of ‘Behold, I Tell You a Mystery’ is characterized by subtlety and enigmatic serenity. Dueling with trumpeter Alan Sedgley in ‘The Trumpet Shall Sound,’ Terfel’s sonorous voice booms authoritatively. Terfel now brings to Messiah the voice of Wotan or Hans Sachs and the slightly reduced flexibility that this implies, but his singing in this performance is by no means undistinguished. He remains a confident, captivating Händelian. 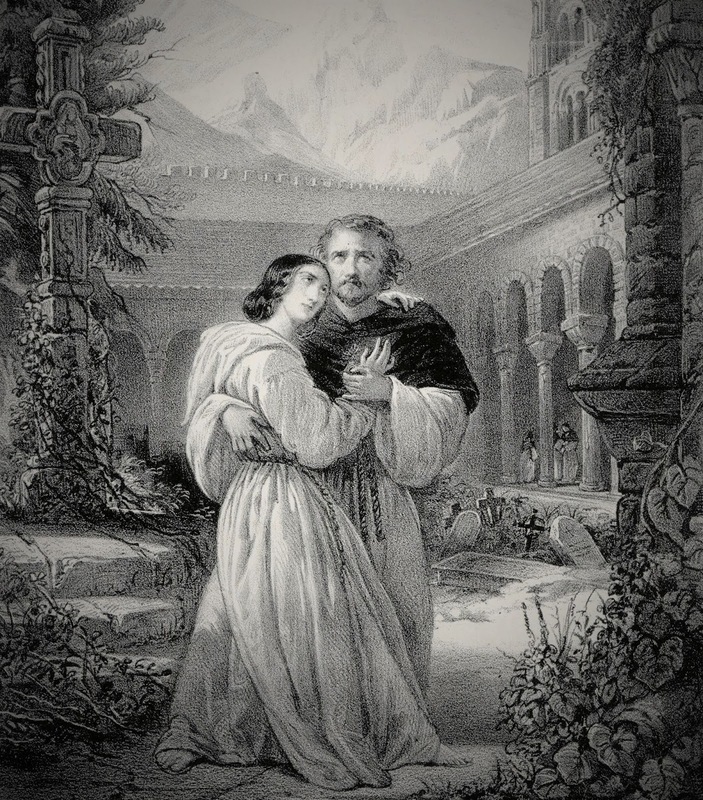 It is unusual for the contralto soloist to be the foremost attraction of a performance or recording of Messiah, but Utah-born mezzo-soprano Tamara Mumford is here a pillar of flair and finesse, traits which also defined her portrayal of Smeaton in the recent Metropolitan Opera revival of Donizetti’s Anna Bolena. Introduced in the fiery ‘But Who May Abide The Day of His Coming,’ Mumford employs her well-honed bravura technique and flickering vibrato to dig into the text, mastering words and notes with equal sagacity. The tranquility that emanates from her phrasing of ‘Behold, a Virgin Shall Conceive’ is quietly moving, and she beautifully evinces the simple joy in ‘O Thou That Tellest Good Tidings to Zion.’ Simplicity is also the hallmark of Mumford’s unaffected singing of ‘Then Shall the Eyes of the Blind Be Opened.’ Her performance of the first part of ‘He Shall Feed His Flock Like a Shepherd’ is one of the finest stretches of singing in this Messiah, followed in the opening minutes of Part Two by her exquisitely-wrought ‘He Was Despised.’ The equal of the sublime ‘Erbarme dich, mein Gott’ in Johann Sebastian Bach’s Matthäus-Passion, ‘He Was Despised’ is essential listening for anyone who questions the extent of Händel’s genius, and Mumford’s singing of it on this recording rivals unforgettable performances by Helen Watts and Dame Janet Baker. The evenness and integration of Mumford’s voice enable her to cover the full range of the music without disruptive register shifts, and she tastefully decorates the aria’s da capo with gorgeous floated notes in the upper octave. The tongue-twisting text in ‘Thou Art Gone Up on High’—try repeating ‘Thou hast led captivity captive’ in quavers and semiquavers!—is nearly as daunting as the music, but Mumford conquers every difficulty. The recitative ‘Then Shall Be Brought to Pass’ and duet ‘O Death, Where Is Thy Sting’ in Part Three draw from the mezzo-soprano radiant, resolute singing. Mumford’s may be the least-familiar of the soloists’ names to many potential purchasers of this Messiah, but her singing is one of the foremost reasons why this recording should be heard. Bulgarian soprano Sonya Yoncheva has in the months since her 2013 Metropolitan Opera début as Gilda in Verdi’s Rigoletto become a much-lauded member of that company’s roster, opening the 2015 – 2016 MET season as Desdemona in a new prodiction of Verdi’s Otello. Though her repertoire includes ‘early’ parts like the title rôle in Monteverdi’s L’incoronazione di Poppea, mesmerizingly performed opposite the Nerone of Max Emanuel Cenčić at Opéra de Lille and preserved on DVD by Virgin Classics [reviewed here], Baroque music is hardly a cornerstone of Yoncheva’s renown. Like Villazón, she sings English with an accent that rarely compromises her elucidation of text, but English phrasing and vowel placement are audibly new territory for her. Still, from her entrance in ‘There Were Shepherds Abiding in the Field’ and through the nativity narrative of ‘And Lo! The Angel of the Lord Came Upon Them,’ ‘And the Angel Said unto Them,’ and ‘And Suddenly There Was with the Angel,’ she emits sounds of considerable allure, the focus of the tone only intermittently undermined by difficulties with English phonetics. Her top A is fantastic, however, and she sings ‘Rejoice Greatly, O Daughter of Zion’ rousingly, tossing off the roulades with appropriate zeal. Following Mumford in ‘He Shall Feed His Flock Like a Shepherd,’ Yoncheva at first seems slightly prosaic, but her experience with bel canto quickly uplifts her extension of lines, her F and G at the top of the stave rounded and full-bodied even when sung softly. In Part Two, the soprano nearly rivals Mumford’s ‘He Was Despised’ with her shimmering singing of ‘How Beautiful Are the Feet.’ After this, her lovely but earthbound traversal of the poignant ‘I Know That My Redeemer Liveth’ at the beginning of Part Three is somewhat disappointing. Nonetheless, her assured voicing of ‘If God Be for Us, Who Can Be Against Us’ just before the final chorus leaves a decidedly favorable impression. 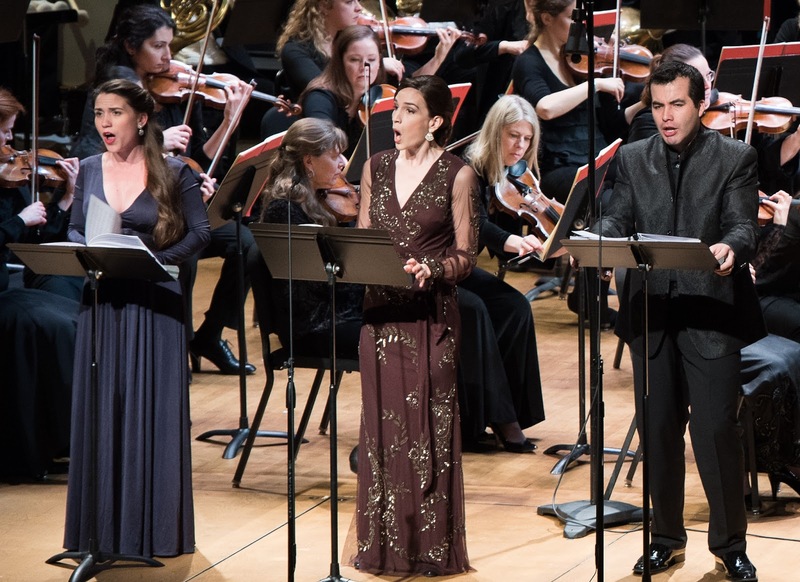 In the long history of Messiah on records, prime donne of the operatic stage have rarely been the most accomplished soprano soloists in Händel’s most popular oratorio. Though not yet fully comfortable with words or music in the performance on these discs, further experience with the score—unlikely considering the demands of her international career, alas—might well usher Yoncheva into the company of those few sopranos who sing Messiah and their preeminent operatic rôles with equal excellence. Not surprisingly, it is the singing of the Mormon Tabernacle Choir that is the core of this Messiah even amidst an ensemble of high-calibre soloists—if not its sole raison d’être, surely its principal raison d’écouter. 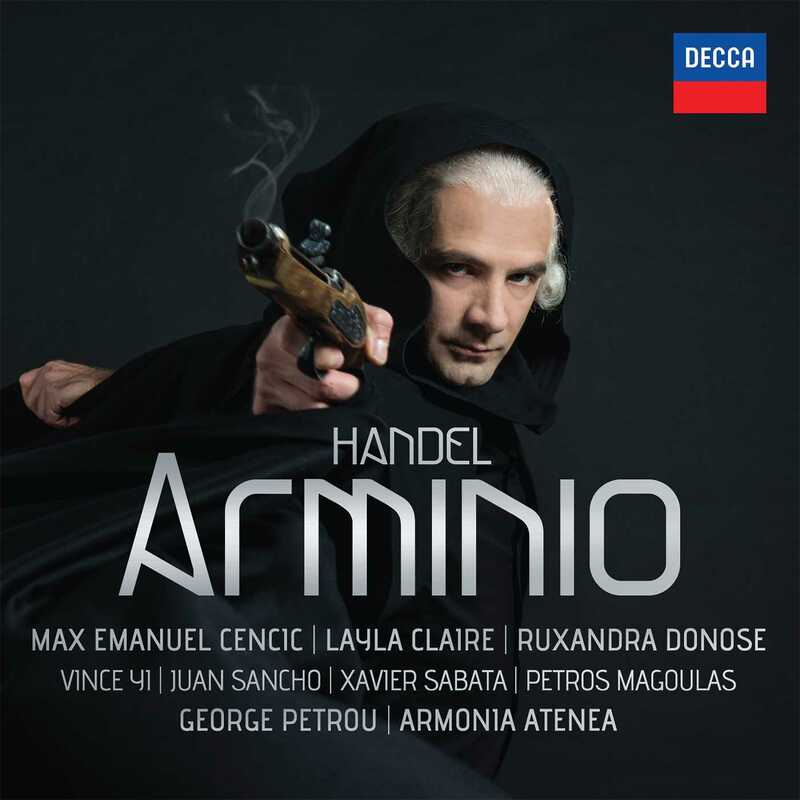 The precision with which a choir of such prodigious numbers executes Händel’s contrapuntal writing is staggering, but the recording fails the choristers to a small degree in this regard. Though balances are for the most part thoughtfully rendered, aside from what sounds like very close recording of the soloists, possibly in an effort to minimize the inevitable acoustical variations among even meticulously-controlled sessions, there are passages in which clarity is lost, especially at top volume. In Part One, the divergent emotions of ‘And the Glory of the Lord,’ ‘And He Shall Purify,’ and ‘O Thou That Tellest Good Tidings to Zion’ are contrasted via management of dynamics. The complementary relationship between ‘For unto Us a Child Is Born’ and ‘Glory to God’ has rarely been more apparent in a recorded performance. The wall of sound built by the choristers in ‘His Yoke Is Easy, and His Burthen is Light’ ends Part One with a deluge of unexaggerated devotion. ‘Behold the Lamb of God’ at the start of Part Two could hardly be more different, the singers’ hushed awe surging on a tide of undiluted musicality. The electrifying progression of ‘Surely He Hath Borne Our Griefs,’ ‘And with His Stripes We Are Healed,’ and the figuratively and literally breathtaking ‘All We Like Sheep Have Gone Astray’ is guided with a sure hand by Wilberg and sung with impeccable poise and formidably reliable tone by the choir. No less gripping are the articulations of ‘He Trusted in God That He Would Deliver Him,’ the exhilarating ‘Lift Up Your Heads, O Ye Gates,’ ‘Let All the Angels of God Worship Him,’ ‘The Lord Gave the Word,’ and ‘Their Sound is Gone Out into All the Lands’ that shape the central arc of the Passion chronicle. The choristers enunciate the ingenious figurations of ‘Let Us Break Their Bonds Asunder’ with gleeful accuracy of intonation and rhythm. Triumphant as the choir’s performance of ‘Hallelujah’ is here, it does not assume greater prominence in the oratorio’s musical and dramatic structures than Händel intended. It is a profound summation of faith and prophecies come to fruition, but it is not bloated as in many performances so that the music that follows seems anticlimactic. Part Three here begins with as galvanizing a performance of ‘Since By Man Came Death’ as has ever been presented in a complete recording of Messiah, and the choir’s soaring tones make ‘But Thanks Be to God’ a number similar in significance to its better-known companions in Messiah. The magnificent fugues of ‘Worthy Is the Lamb That Was Slain’ and the concluding ‘Amen’ are not so much sung as felt: the conviction with which the voices ring out is palpable, igniting sparks that illuminate the skill with which Händel ended this world-altering score. Amidst the plethoras of challenges facing Classical Music in the Twenty-First Century, efforts to record Messiah are no longer as regular as death and taxes. This makes the appearance of a recording like this new one by the Mormon Tabernacle Choir all the more valuable. 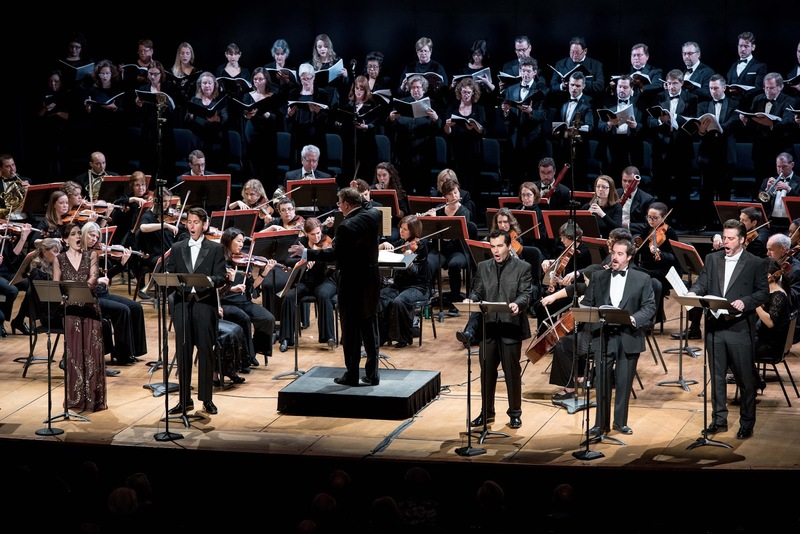 Händel’s Messiah is a perpetual feast, and this recording offers a delectable new course. Were he to hear the music performed with the sincerity and grandeur achieved on this recording, might Jennens revise his opinion of Händel’s setting of his carefully-tailored text?